Below you find the episode guide of the upcoming Sky Arts drama A Young Doctor's Notebook. Based on Mikhail Bulgakov’s collection of short stories, A Country Doctor’s Notebook, the series follows a recently-graduated young medic (Radcliffe) who is forced to say farewell to life in bustling Moscow to take up a post as a doctor in a small, remote hospital a thousand miles from the capital, and half a day’s journey from the nearest shop. Hamm plays the young doctor 17 years on, who finds his old diary while answering to the authorities about self-prescribing morphine. He has a series of comic exchanges with his young and inexperienced self, mocking him for his youthful looks and guiding him through his early difficulties on the job. 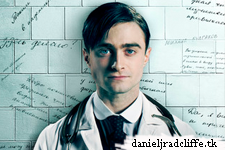 The young doctor (Radcliffe) grows increasingly frustrated with his patients, who exploit his naivety and fail to heed his desperate warnings about the dangers of syphilis. When an eight-year-old girl falls on a lathe, he is also forced to conduct a double amputation. Blinded with panic, his older self (Hamm) does little to put his nerves at ease as he prepares his blunt saw for the operation of his career. While revolution hangs in the air in Moscow, the young doctor (Daniel Radcliffe) feels increasinglyisolated in the tiny and remote village of Muryovo. Longing for cigarettes, a newspaper and “a knock on the door that isn’t a dying girl”, he packs his trunk for the day-round trip to the nearest shop, only to learn that it doesn’t open until August. Desperate to escape, he jokes about how many people he might have to let die before he is stripped of his licence and allowed to return to the bright lights and shops of Moscow. Meanwhile, his older self (Jon Hamm) begins to suffer from the unsavoury side effects of his acute morphine addiction. The doctor is hit by terrible stomach pains when an unconscious girl is carried into the surgery. To his horror, he realises he will need to perform a complicated tracheotomy; however, the hardest part is convincing her family that the girl’s problem cannot be solved with drops or pills. After also assisting during a tragic birth in the snow, the doctor takes to his bed, bent double with stomach ache. Desperate to stop the pain and to escape the snow and boredom of Muryovo, he reaches for his medical bag. And, despite the protests of his older self, fills a syringe with morphine. After a performing a recent tracheotomy made him famous, the young doctor (Radcliffe) is inundated with patients as the episode opens. However, despite his newfound celebrity, behind closed doors he begins to experience the embarrassing and unsavoury side effects that have been plaguing his older self (Hamm). Repulsed by what is happening to his body, the young doctor takes a bath. Joined in the tub by Hamm, he vows to make a clean start and decides to open a specialist syphilis clinic to combat the disease rife in his remote village. During a long journey to a patient with a critical head injury, he defiantly hurls the key to the morphine cupboard into the snow. But, on his return, withdrawal symptoms hit him hard. His older self makes an unwelcome appearance in the carriage, blaming the young doctor for destroying his life, dignity and friendships with his weakness. In too deep to heed the warning and turn his life around, he throws himself from the carriage and begins to search for the lost key. But, while scrabbling in the snow, he spirals into dark hallucinations in which he is haunted by a terrible fate and a visit from his revered predecessor Leopold Leopoldovich. How many episode there are in total ?